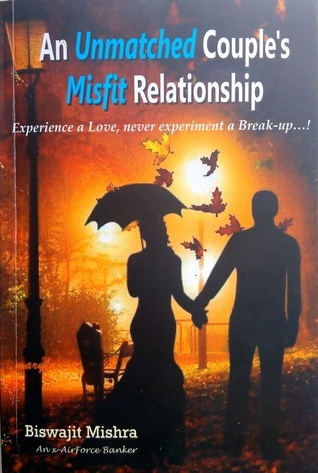 An Unmatched Couple's Misfit Relationship: Experience a love, never experiment a Break-up by Biswajit Mishra is the writer's debut book. As per the title, the plot based on experiencing love and breakups by the female lead. I feel the cover page little blurry. It could have been better. The female protagonist Paayesha is a bank employee. The other main character is Rishav, Paayesha's colleague. The story revolves around Paayesha's love life and broken relationships. She falls in love for more than one time. Rishav, one of her love interest is always stand by her side in all the hard times. Paayesha has experience depression, but with the help of Rishav, she moves on. Paayesha's character is full of drama and misery, while Rishav proves to be a light bringer. They like each other, but distance and immaturity tore their relationship. The story is thought-provoking, but why we always look up to someone else for contentment? We are the key to our happiness, and soon we realize this fact, sooner we find inner solace. The characters didn't grow with time. I feel that the characters are weak and dumb. But somehow the reader can connect with Paayesha or Rishav's character in real life. The abrupt end also disappoints me. The language is lucid, but I find few typo errors. Biswajit Mishra narrates college love, problems create because of alcoholism, extramarital affair, depression, and most important the need of love in one's life. The story has different aspects which make it an engaging read. But as a reader, I expect more to read about other characters POV. The family didn't play a vital role. Overall, the book is fast-paced. It is a good pass time read for newbies and romance fantasy lovers. All the time she hoped and dreamt of a better tomorrow in her life in a span of six years. Her experiences are both good and bad; the man, the mind and the moral… where, repeatedly she failed, woke up and then moved on. She realized four men in a span of five years. While in the search of the fifth man on her sixth year, what she expects, and finally accepts…? Is that a fortuitous Paayesha finally impounded felicitously? It would be favorite stuff in a single gulp, for anyone, whoever had experienced a break-up at least once in a lifetime.